These blanko shirts are waiting for you to create a custom design to print on them. 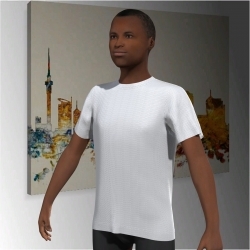 Choose a fabric, pattern or template and get started in our 3D online designer! You can create whatever you like and fulfill the wishes of your little ones. No matter if your kid wants to be part of the fire brigade, fight evil as a police officer or live in a magnificent castle as a princess ‒ you can print hobbies, interests or idols of your child all-over and full-colour on the whole shirt’s surface. You can even design the sleeves. We will print your design onto your new shirt by dye sublimation printing offering a lot of advantages like durability, highest colour depth and resolution and wearing comfort. Our designer is childishly easy to use. You can let your kids design the shirt by themselves or you can help them doing it. Just give it a try! Our short-sleeved t-shirt for kids is available in a wide selection of fabrics and is suitable for sports, relaxing and every day wear. 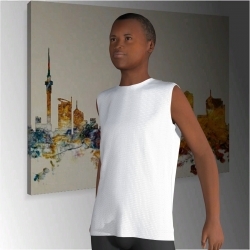 Stylish sleeveless t-shirt for children, a selection of fabrics available, ideal for sport and leisure activities.